Jamaica's UWI Open is set! Bert Scott, "National Champion Shane Matthews favored to win 2003 U.W.I. 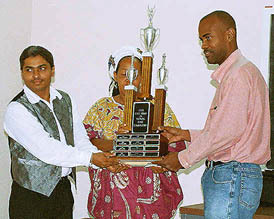 Open Chess Championship," Jamaican Ambassadors Chess Academy." National Chess Master Shane Matthews, the reigning chess champion of Jamaica, is the hot favorite to win the 2003 UWI Open Chess Championship at the Rex Nettleford Auditorium on Saturday and Sunday, November 22-23. National Master Duane Rowe who recently won the Clarendon Open, is expected to provide strong opposition to Matthews in the quest for the first prize of $10,000. Also in the hunt is Jamaica Open Champion, FIDE Master Warren Elliott, who is at the top of his game at present, and could easily add the UWI Open to his list of recent tournament conquests. National Women's champion, Deborah Richards should emerge the best female of the Open following her superb performance at the Jamaica Open in Montego Bay. Richards defeated NM Rowe, NM Richard Haughton, and drew with NM Russel Porter to produce her best results among the males, to date. National Champion NM Matthews receives the National Championship Trophy from Mrs. Lorne and JCF Vice President, NM Mark Holness. Jamaica's newest National Master, Ras Malaku Lorne will no doubt add an air of uncertainty to the mix, as well as the presence of the forgotten National Master, Richard Haughton from Mobay. Advance Registration for the UWI Open are being accepted at the Liguanea Chess Club on Ardenne Road. The first round of the UWI Open begins at 10:00 am on Saturday. For further information, contact UWICC, Vanessa Thomas at 793-6376 or at lishnessa@yahoo.com Information will also be available at www.chesswave.com.